Absynth versions 3, 4 and 5, the ground-breaking software synthesizer from Native Instruments. This collection includes128 highly-refined sounds, specifically crafted to fill contemporary music production needs. 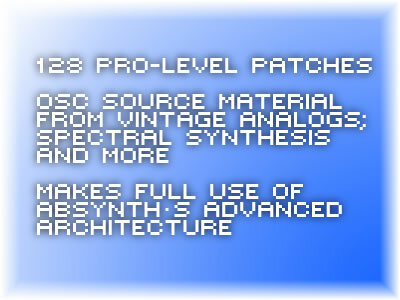 While programmed to make the most of the unique synthesis capabilities provided by Absynth's flexible architecture, The Sound Xpansion Collection also employs completely new audio source material. Wave data has been derived from physical models, advanced additive synthesizers, classic analog modulars and much more. Combined with Absynth's deeply configurable synthesis engine, the resulting sounds contain a completely contemporary quality coupled with an underlying organic 'feel'. To effectively serve as wide a range of users as possible, this library is delivered in a single package which works seamlessly with Absynth versions 3, 4 and 5, on both Macintosh and Windows platforms.